The Dry Martini might appear simple, yet this iconic drink, the undisputed 'king of cocktails', offers much more than the sum of its parts. The time-honored ritual of its creation, the premium quality of its ingredients, the personalized choices of proportion, garnish and mixing technique - all combine to create something unique and magical. First recorded in the late 19th century, the origins of this quintessential bartenders’ cocktail are disputed by bartending historians. Over the years it has evolved and adapted, influenced by the ever-shifting trends in cocktail culture around the globe. Today, you can make your martini in a variety of different ways, according to personal preference. There is no ‘correct’ method. That said, we’re fully confident that if you follow our guide, you’ll enjoy outstanding results every time. If you do not have any of these essential bar tools, our Deluxe Martini Gift Set contains everything you need to get started. We recommend this combination of Absolut Elyx and dry vermouth for our signature martini. The delicate notes of the many botanicals used to create dry vermouth complement the rich and silky texture of Absolut Elyx. 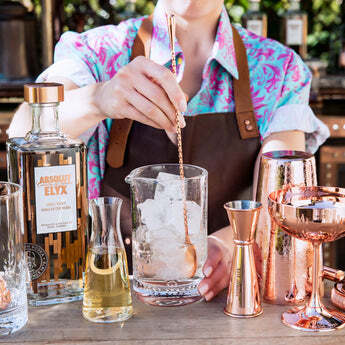 Measure the Absolut Elyx and dry vermouth into a mixing glass or tin. Fill with good quality ice and stir using your bar spoon until ice cold. Strain the drink with your julep strainer into a chilled stemmed cocktail glass. Garnish with a lemon twist. If your cocktail recipe calls for you to stir with ice and strain, stir in a mixing glass or shaker using a bar spoon. Place ingredients into the mixing glass and twirl the bar spoon gently between thumb and finger. Be careful not to over stir a drink – you are stirring your cocktail in order to primarily chill it, not to dilute it. After stirring, the drink should be strained into a glass using a julep strainer. When you see the phrase ‘shake with ice and strain’ you should place all the necessary ingredients in a cocktail shaker, add cubed ice and start the shaking action. Then you should strain the liquid into the glass leaving the ice behind in the shaker. Shaking not only mixes a drink, it also chills and dilutes it – always fill the shaker at least two thirds full with fresh ice, as too little will quickly melt in the shaker producing an over-diluted cocktail. There are many different ways to shake a drink. If you need to break down fruit and ice during the shaking process for example, you should shake short and hard. If you are shaking the drink purely to mix and chill the ingredients you should shake more softly. To ‘throw’ a cocktail describes the action of moving liquid from one vessel to another repeatedly at arms length until the correct temperature, texture and dilution has been achieved. This creates a similar result to that of ‘mixing’ but with more theatre. This technique is commonly used for liquor only drinks, like the martini. Rolling (or ‘rock and rolling’) describes the action of moving the entire contents (including ice) from one mixing vessel (shaker or jug) without using a strainer, to another mixing vessel at a slow and gentle pace, keeping the two vessels close to each other. This should be done continuously until the correct temperature, texture and dilution has been achieved. This technique is used only when light dilution and mixing is required. the flavor and aroma of your cocktail through methods such as zesting. Ensure that you always cut a fresh garnish for every cocktail you make. – you cannot (and must not, please) prepare zest in advance. For a more dramatic flamed zest, take a firm, thick skinned navel orange or lemon and, with your bar knife, cut a wide strip of zest. Hold the cut zest, peel side down, between thumb and the forefinger about 6cm above the drink and gently warm the zest with a lighter flame. Then, pinch the peel by the edges so that the oils squirt through the flame towards the surface of the drink. There should be a flash as the oils ignite. Be careful not to hold the flame too close to the drink as it will leave a smoky film on the glass. Finally, wipe the zest around the rim of the glass and drop into the drink. Aside from the theatre surrounding the garnish, the flamed aromatic oils add a new dimension of flavor to the drink.